Famous Hispanics abound in today’s society though we rarely shine a spotlight on them as brightly as during Hispanic Heritage Month which takes place between September 15th and October 15th each year. Much of the focus is on the Hispanic and Latino contributions to the world of entertainment like Jennifer Lopez, Salma Hayek, Shakira and George Lopez just off the top of the head. There would be quite a few people on this list. When it comes to sports though the rising contributions of baseball players from Hispanic countries like Puerto Rico and the Dominican Republic can not be denied. If you are a baseball fan, even a young one you would be able to spout out the names of famous Hispanic baseball players like David Ortiz, Alex Rodriguez, and Manny Ramirez just to name a few. Before they all came along Roberto Clemente paved the way. 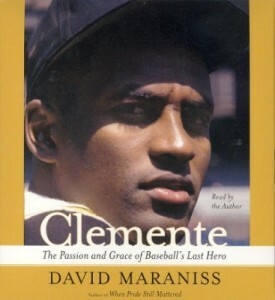 We are spotlighting the David Maraniss biography on the life of Roberto Clemente. A famous Hispanic baseball player that unfortunately died at the young age of 38 while attempting to deliver relief supplies to the victims of an earthquake in Nicaragua back in 1972. He was an unexpected humanitarian. Though his death was tragic and noteworthy it was his life that highlighted what one person can do both for his country of Puerto Rico and his chosen sport of baseball. Though he was not recognized in life as he was after his death Clemente broke down many barriers for both Hispanic baseball players and Hispanic sports figures overall. Looking back on his career he achieved many baseball milestones including making it into the 3000 hit club during the season that preceded his death. We highly recommend this audio book not just for it’s historic significance for Hispanics but also as a review of an impressive Hall of Fame baseball career. Download Clemente on Audio Today.